8" 8-segment fishing lure. 2 strong and sharp treble hooks. 3D lifelike eyes. High resolution body detail. Smooth and rapid diving action. Life-like swimming actions in water to provoke predator to bite. 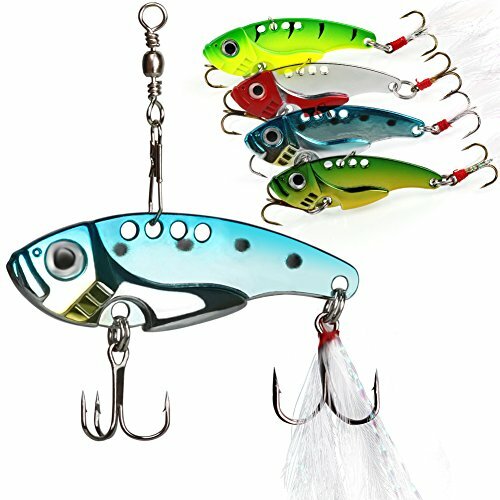 Spinner spoon fishing lures, features vivid fishing lures, sharp hooks, ,which makes it the powerful fishing catching seduction and it is a metal blade lure that has an incredible vibration as it's retrieved. 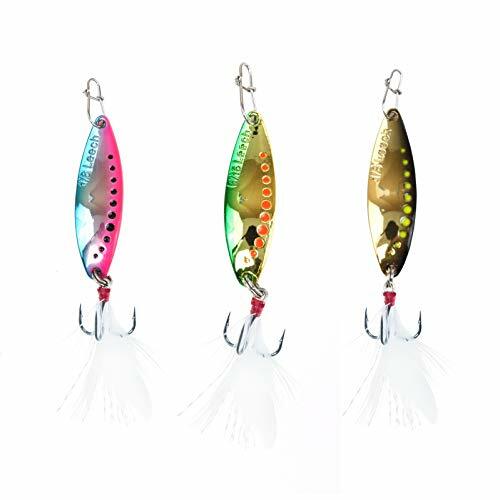 PRODUCE MORE FLASH: Sougayilang fishing spoons display brilliant flash in the water due to its genuine silver and gold plating, and more reflective surfaces attract fish and make them strike. UNIQUE 'S' SHAPE: Its unique 'S' shape allows it to move in the water like no other spoon. It looks like swimming action and rapid diving action into water. 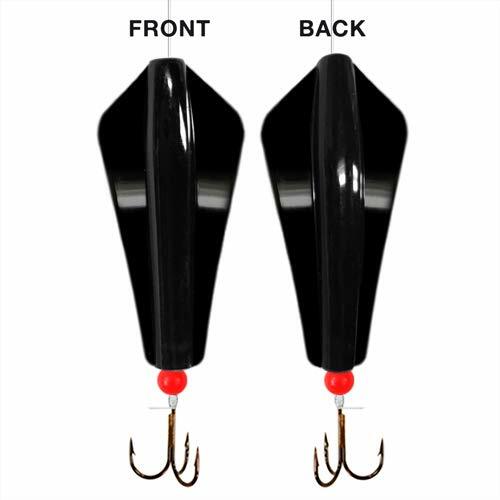 EXTRA NOISE: The dimpled texture on these spoons creates extra noise and reflects more light in the water to attract fish.The high quality solid brass construction is rust-resistant and durable. FRIENDLY: water-based environmentally friendly premium paint finishes. Weight: approx 0.53oz/pc, Length approx 4in including the hook and feather. Pack of 3pcs Silver and 3pcs Gold. Ideal for trout, pickerel, panfish, smallmouth bass, snapperblues etc. 1. It includes almost the lures and accessories you need to fishing. 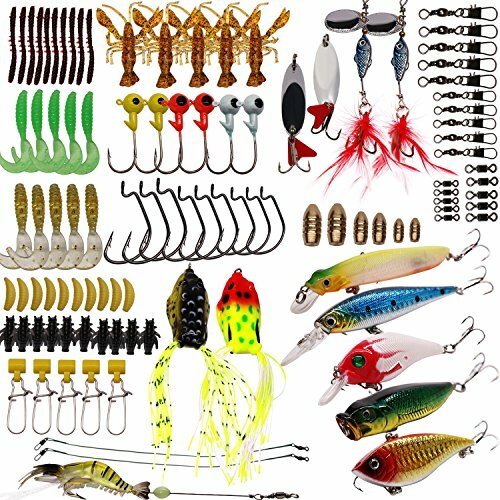 INCLUDED - The fishing lures box set comes with 53-105pcs necessary fishing lures and accessories: Fishing Lures, Hooks, Jig Hooks, Sinkers, Barrel Swivels, Fishing Line Sliders, Clip Connector and Free Tackle Box. suitable for all sorts of fishing conditions. PICK IT UP - Bring it with your fishing trip, easily fits in your fishing seat box, fishing backpack and fishing vest's pocket, Make your fishing more convenient, no need to worry about miss lures and accessories. USEFUL - These Fishing lures are designed to be used in freshwater or saltwater. box contains some common baits and accessories that can be used in a variety of fishing occasions. SIZE - The fishing tackle is equipped with a compact box. Box Size: small and big. Weight is approx 6.5-14oz, portable size and weight for carry besides wherever you go to fishing. 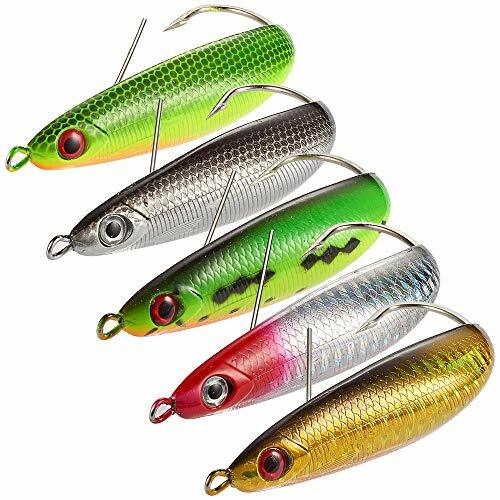 Nordtale Bobby Fishing Lure is made with extra durable materials. 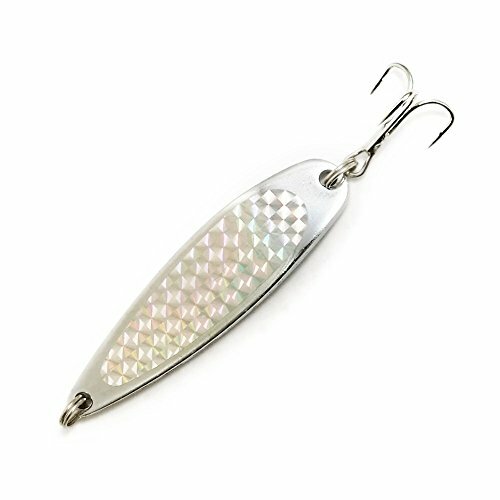 Nordtale Bobby Fishing Lure comes with nickel treble hooks with feather and stainless steel split rings. Bright color of the lure helps to attract fish more often compares to our competitors. Nordtale Bobby Fishing Lure comes in a fun design, it's a perfect and fun gift! 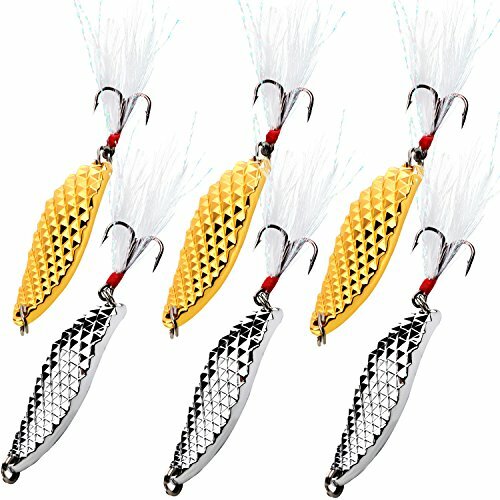 Nordtale Bobby Fishing Lure is perfect for freshwater and saltwater, surf fishing, outdoor fishing, ice fishing, salmon fishing, marlin fishing, trout fishing, panfish fishing, bass fishing, ocean fishing, sea fishing, river fishing, walleye fishing, steelhead fishing, carp fishing, pike fishing, catfish fishing. Top choice for spinning, trolling, jig and baitcasting. 5 sizes available: 3g, 7g, 11g, 15g, 21g. 2 color choices: Gun Black, Chrome Rose. Product features: faster cutting water, fun design, nickel treble hooks, stainless steel split rings, mega durability. With Nordtale Bobby Fishing Lure you will have great fun fishing and big catches too! Kastmaster's balance produces wild action without line twist. Because of its aerodynamic design, it's the master distance caster, and catches fish from pan-sized trout to bragging-sized stripers - in fresh and salt water. ABS material outside which is avirulent and odorless, environmentally friendly. It creates life-like swimming actions in water and attracts predator to bite. 3D eyes keep it look as realistic as natural live baits. 3D lifelike eyes, High resolution body detail, 6 strong and sharp treble hooks. 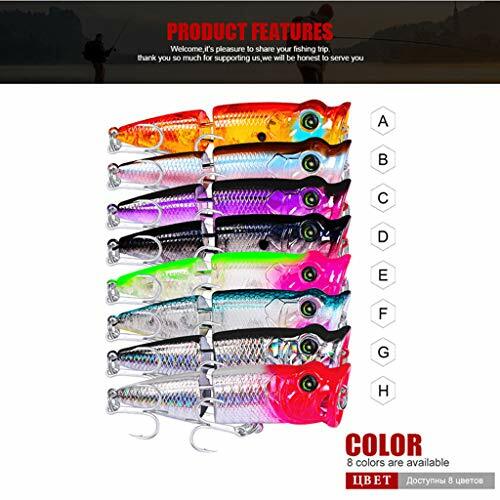 Brilliant colors:Brilliant colors and realistic crankbait with lifelike bait fish swimming action to attract fishes which can be used in both saltwater and freshwater. Diving Deepth:0.5-1.5m.These minnow lures targets fish in upper and mid water, including Bass, Chub,Tilapia Blackfish Walleye, Redfish, and Speckled Trout, etc.. They feature bright colors, dual anti-corrosion hooks, stainless steel split ring and simulated fish scale. All styles have a brilliant crystal fish attracting reflection, a responsive darting action, durable ABS body material and new sharper stronger hooks. Vivid 3D eyes and lifelike scale patterns.Create lifelike swimming action to attract predators' attention. ABS material , environmentally friendly. 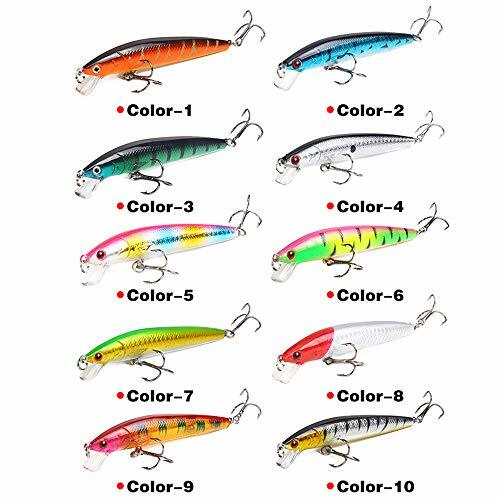 Diving depth:0.6-1.8m..These Popper lures targets fish in middle and upper water, including Striped bass,tuna,catfish,Sea bass,chub,Squat, etc.. They feature bright colors, dual anti-corrosion hooks, stainless steel split ring and simulated fish scale. Long Casting. Rattling ball loaded work as weight transfer system and additional attractant. Seductive wobble. The minnow wobbles at a subtle move of the line, produce irresistible action underwater. Weedless Design. The metal weedguard prevent the spoon get caught in vegetated areas, swim across any water without limit. BKK Single Hooks. Features natural laser coating, durable ABS body, and BKK hooks for high catching rates. Freshwater and saltwater killer. Perfect for boat fishing, rock fishing, beach fishing, lake, river, pond and stream. Catch bass, trout, catfish, pike, salmon, redfish and stripers. 1.Adjustable Retrieval Design:Sick waggle action adjustable by tie-on location. 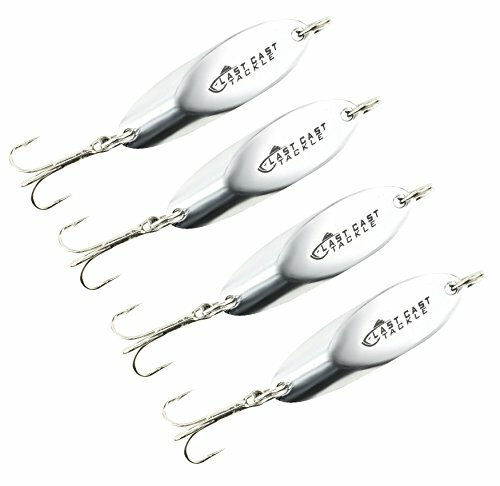 Three line tie adjustment holes,tying on different hole will appear different performance, front hole for jerk & fast retrieve,center hole allows lure to be jigged,the last hole to lift fall. 2.Decent Quality:The blade bait reflect the light very well which is gonna catch the attention of any fish. They also have a nice weight to them, so you can cast them really far and they sink to the bottom really nicely. The lure body is well made,size is perfect for fishing,they vibrated a lot.Finish on these blade baits are durable through brush and rocky bottoms. Excellent vibration to attract bass.Cast well, flutter nicely. Brilliant colors and realistic crankbait with lifelike bait fish swimming action to attract fish which can be used in both saltwater and freshwater. 3.Perfect Components:Pretty solid in construction,3D eyes keep it looks as realistic as natural live baits. There are multiple assortment of colors to fit your water color. Some of them have detailed patterns, others are smooth. The 8 pieces/set come with duo-lock snaps to attach the line to the bait. Blade baits came in a case. 4.How it works: Gently vibrate the fishing rod intermittently to make the lure swims under the water. Pull the fishing line in order to make the lure float up and down, this action will make some waves and the fish will be attracted. The fish will be attracted by the life like action and bright color. 5.Target Fish:walleye, saugeye, white bass, crappie, bluegill, and catfish,black bass,Striped,bass, sandies dies, bream,etc. 3.Perfect Components:Pretty solid in construction,3D eyes keep it looks as realistic as natural live baits. There are multiple assortment of colors to fit your water color. Some of them have detailed patterns, others are smooth. The 8 pieces/set come with duo-lock snaps to attach the line to the bait. Blade baits came in a case. 4.How it works: Gently vibrate the fishing rod intermittently to make the lure swims under the water. Pull the fishing line in order to make the lure float up and down, this action will make some waves and the fish will be attracted. The fish will be attracted by the life like action and bright color. 5.Target Fish:walleye, saugeye, white bass, crappie, bluegill, and catfish,black bass,Striped,bass, sandies dies, bream,etc. BUY WITH CONFIDENCE: 24h friendly customer service and email support. If you have any problem, please contact our customer support and we will reply you within 24 hours. CJ Special lures have an action unlike any other lure on the market. Darting laterally through the water in an obnoxious swimming pattern that predatory sport fish find irresistible; 5" medium body aluminum CJ's are designed for trolling and mooching. The CJ Special has been used to targeting a wide variety of fish species in freshwater, saltwater, lakes and rivers. Mustad Ultrapoint extra sharp single hook. UV Aqua Scale, Prismatic Silver and Holographic Gold extra-durableMylars. Extra strong welded rings and swivel rig. Trolling - Troll at speeds of 2-4mph behind a boat from a downrigger deep diver device or by adding lead weights to the line. Buy this metal spoon bait from PEETZ Outdoors and evaluate it for yourself. PEETZ guarantees this product against defects in manufacturing for the useful life of the product. Terms and conditions apply. 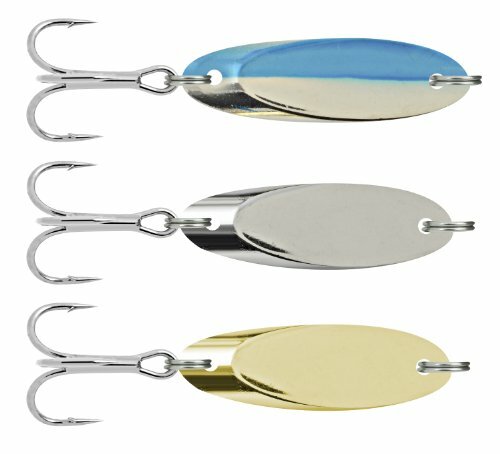 PEETZ spoons feature premium, ultra sharp hooks. Store out of reach of children. Se uelos de pesca de aluminio. Brillan en la oscuridad y ultravioleta. Gancho agudo (acero de alto carbono). ONE OF A KIND SWIMMING ACTION | The CJ Special spiral lure swims unlike anything you already have in your tackle box. 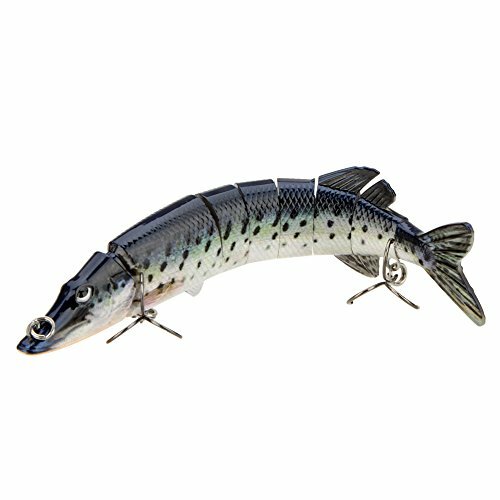 With an isometric, perfectly balanced design and a specific, bend and twist in the tail, the lures roll in one direction, then reverse and roll in the opposite direction. HIGH QUALITY MATERIALS | Powder coated Aluminum blank, Sharp Mustad Ultrapoint hooks, Welded rings, 60lb swivels. VERSATILE | Trolling action imitates baitfish minnows such as Anchovy, Herring or Pilchard. KEY SPECS | High Tensile Strength Aluminum. Body length: 5 inches. Weight 24 grams. Hook: 7/0 Mustad Ultrapoint. ESPA OL | Para ver las caracter sticas en espa ol, consulte la descripci n a continuaci n.
Available with a variety of popular spoons, Clam Pro Tackle Jigging Spoon Kits are great for the beginner, or make great gifts. Everything you need for a great day on the ice. Our most popular products, sizes and colors!